Visitors are always made extremely welcome. The present lodge warrant is dated 1976 and is the third to have been issued by Grand Lodge with the Number 27. The first warrant was issued 19th January 1734 and subsequently appears to have been lost as a new warrant was issued on the 20th December 1750. The Lodge met in Cork City until 1835 when it merged with the First Lodge of Ireland and the Warrant transferred to Castletownsend where it worked until 1858, when it was returned in trust to Grand Lodge. In 1876 No. 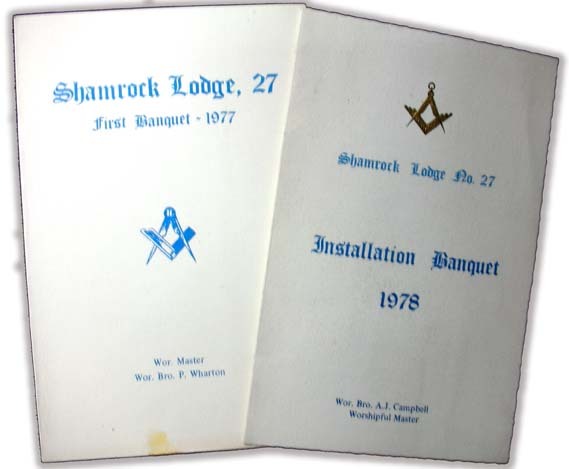 27 was restored under a new warrant to Dublin and its name changed from ‘Shamrock’ to ‘Abercorn’. In 1945, due to declining membership the Warrant was returned to Grand Lodge. In 1976, 14 Cork brethren who wished to found a new Lodge were granted this old and historic number. Today, Shamrock Lodge No. 27 flourishes, and is the largest lodge in the province of Munster with over 50 members. 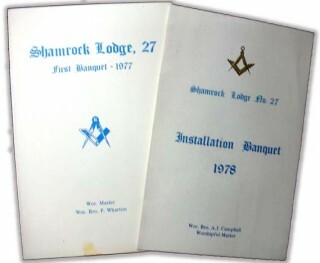 The full history of this Lodge is fascinating to the student of Masonic history and we are fortunate that our earliest minute books provide a wonderful view of Freemasonry in Munster during the 18th and early 19th centuries. Visiting Brethren are always made extremely welcome at our meeting. This number was originally issued to CORK, 19 January 1734, and by the following year, was meeting at the Golden Fleece in Blarney Lane (Smith, 1735). A duplicate warrant was issued, 20 December 1750, and the lodge continued in the city until suspended, 3 July 1823. A new warrant was issued to CASTLETOWNSEND, nr. Skibbereen, Co. Cork, 8 July 1835, in lieu of No. 167. It met in the homes of the Somerville families in the village until the warrant was handed in trust to Grand Lodge, 27 October 1858. The number was restored, under a new warrant, to DUBLIN, 6 January 1876 under the title ‘Abercorn Lodge’. The new warrant was returned and the lodge continued to work under the old warrant until 1 March 1945, when it was surrendered.